You know how “this is just the beta version” is actually code for “this is the product for the next 3 years until we get funding to make it better?” That’s just one of the ugly truths that always gets smirks and head nods when talking about software development with our health system/provider institution clients. “Agile” and “iterative” are always spoken of fondly, but the economics of healthcare IT doesn’t allow for that. Every software project, every enhancement request needs pages of business justification and budget approval. That is a humongous barrier to the adoption of new technologies like SMART on FHIR that can actually make a difference in healthcare. SMART on FHIR is a true game changer. You can bring advanced Clinical Decision Support into any workflow, you can ensure physicians on different EHRs are seeing the same thing and taking the same actions, and you can build functionality into your EHR that will never be there otherwise. 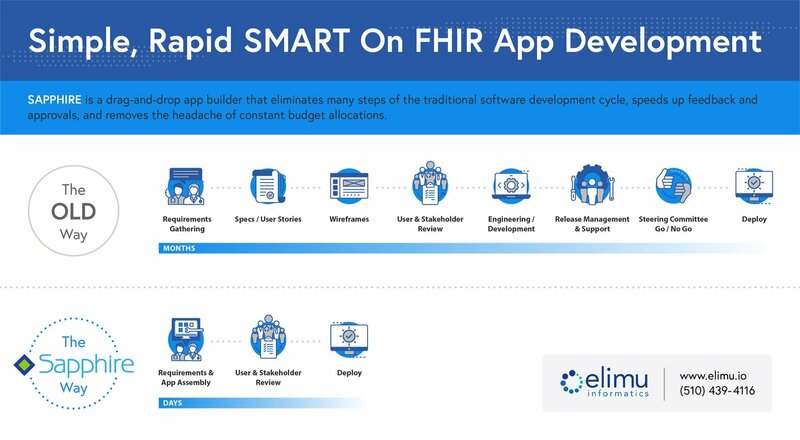 So how do we make SMART on FHIR apps affordable and scalable for provider institutions? We have to address the two biggest costs in the equation – the cost of software development, and the amount of time it takes. That’s why we built Sapphire App Assembler. With Sapphire we built an ever-growing library of reusable “widgets” (problem list, med list, lab trending graph, etc) based on standard FHIR resources. Those widgets are point-and-click and drag-and-drop allowing users to quickly assemble widgets into full blown SMART on FHIR apps. Your software developers stay on the bench, and project times are dramatically reduced from months to minutes. To be fair, there will always be checks and balances within any given organization when it comes to putting applications into users’ hands. Sapphire simply speeds those checks and balances up, and even eliminates a few along the way. For example: how many person-hours worth of meetings occur before software development actually begins? There are requirements gathering sessions, wireframe feedback sessions, approval meetings at each step of the way; the list goes on. All of those meetings are held so that expensive development resources don’t have to be engaged until everything’s absolutely ready for them to develop and to avoid costly redos. With Sapphire you bring working apps to every single meeting which means you need far less meetings. Meeting attendees no longer have to imagine how something will work, they can give direct feedback immediately. And anything that’s missing or “wrong?” Just fix it on the spot and keep moving. No more treating “scope creep” and “enhancement requests” like four letter words. If you want to get something into your clinicians hands quickly, and iterate, you can. If you need to build another app, just do it. If you have Sapphire, you can update/enhance and build as many apps as you want without incurring further costs.